A week of Christian summer camp is filled with faith, fun and fellowship for children and youth to grow in their spiritual journey. Regardless of the age, campers make memories for a lifetime and come back year after year. 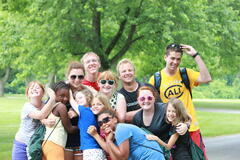 We offer a variety of programs for campers of all ages. *Please note that age groupings vary from program to program. Click the "read more" links to see age ranges for each program. Have a question? Ask Julie!